I've recently joined a popular affiliate forum. I was amazed that dozens of people sign up to this board alone daily to find their way in making money online. And, guess what, all these new affiliates have one and the same first question: they're puzzled about how to find their niche. Indeed, is there any roadmap every newbie could use to brainstorm different affiliate opportunities? How to find your affiliate niche? In particular, what advice on selecting a niche you wish you'd got when you were just starting out? This article contains experts' replies, which include the exact steps to take, some unexpected tricks and main things to consider when exploring the exciting world of affiliate earnings. If you are just starting out online and you have decided to become an affiliate marketer, here is my advice to help you choose a niche. - What do you care enough to spend time doing every single day? - What affiliate products are there in the niche you can sell? - How much do you make per sale? - Are there any recurring subscription products you can sell? - Do you know the average conversion rate of the products? - Are there many different products at different prices you can promote? - How much competition is there in that niche? The problem with some niches is you will find that the only affiliate products you can sell are through things like Amazon Associates, a great program, but it pays very small margins. You might only make a dollar or two per sale. If you can find a niche where there are ebooks, or courses, or software or live events that you can promote, often these pay 50% commissions, which means you make much more per sale. I have promoted a course that came with software that paid out $1,500 per sale in commission. You only need to make ten or twenty sales and you have enough money to live off for an entire year in a country like Thailand! It's important you focus on a niche you care about, because you will need to put in quite a bit of time creating content and marketing your work to attract traffic. Without doing the work you won't have the traffic and no traffic means no sales. I also recommend you search for affiliate programs that are recurring subscriptions, so you get paid over and over again each time the product rebills. It's important that a niche you go after has the potential for you to build a real business behind it. That means there should be multiple products and people willing to spend money on many different things. Make sure you research how much competition there is in a market, but to be too afraid if you find some people already doing what you want to do. That’s a good thing because it means there is money to be made. The worse situation is if you can't find anyone, which probably means it’s not a profitable market. The most important tip I have left for last. Whatever niche you go after, make sure you build an email newsletter for it. You will make more affiliate sales via email marketing than any other method online. Yaro Starak is the founder and writer of Entrepreneurs-Journey.com. Since 2005 through this blog, his email newsletter and in training programs under the EJ Insider Membership, Yaro has taught thousands of people how to make a full time income from blogging part time, how to buy and sell blogs and websites, and how to successfully launch an information product business. Follow Yaro on Twitter at @YaroStarak. I was always taught from a young age to find what you love in life, then find a way to make money at it. I believe that also applies to the web! Work out what you love the most in life. What is your favourite hobby? What do you know most about? What is your true passion? Once you have worked that out then take a look around at what types of websites are floating about in that space. Make a bullet point list of what you like and what you don't like about each one. Next try and note down 5 common problems people face in the niche. This is the beginning of your content strategy. Then start taking a look around at affiliate opportunities. Who are the merchants/businesses you can partner with to earn money? Don't forget you can also earn money outside of affiliate sales by creating your product(s) and selling advertising space. 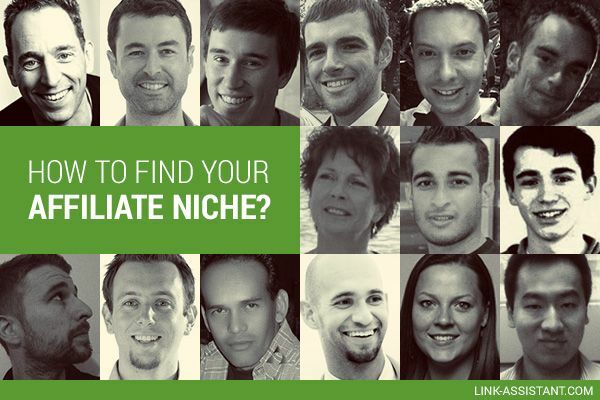 After a few hours of research you should have a good feel and understanding of the niche. You'll also know exactly what your website needs to be/do, the type of content you need to produce and how you can make money. Lewis Ogden also wrote an awesome tutorial on how to find proven money making niches. Matthew Woodward built a top 100 blog in 12 months purely by focusing on creating high quality content. He has won a range of awards for his content including Problogger One To Watch 2013, Unbounce Top 75 Internet Marketing Blogs and Search Engine Journal Best of 2012. Follow Matthew on Twitter at @MattWoodwardUK. I started out with checking the potential of affiliate offers in affiliate networks. I checked search volumes and competition using Google Adwords Keyword Planner and Google search results. If there wasn't a lot of competition, I'd set up my site. Most of my early niche affiliate sites were in the fashion market promoting physical products like women's winter boots for example. After a while I noticed that it was hard to maintain those sites since I didn't really have a specific interest in the fashion market. What I learned is: it's very important to do something you like because that will keep you motivated to grow your sites and consequently your earnings. Start with making a list of your favorite hobby (or hobbies), your talents and interesting experiences you've had. If you use this as a starting point, you will never run out of ideas to generate content, which is essential for online marketing. Use this list to start by checking search volumes for your keywords in Google Adwords Keyword Planner. Furthermore, you have to know if there are products and people willing to buy for your niche. You can see that by checking out if there are ads in Google. You can also join a few affiliate networks to see if there are any offers related to your niche. Another source that might help you is Amazon: check out if there are books that sell well in your niche. This means there is an audience and you can use that as inspiration for your content. Frank Hussman is an independent internet marketer advising small and large (international) clients in The Netherlands about online marketing. As an affiliate marketer, he owns multiple websites in different niche markets. He is author of two books, his latest Dutch book is about content marketing. Follow Frank on Twitter at @upthevortex. Looking back over many years of building affiliate websites, choosing the right affiliate niche has always been the number one factor between success and failure. Many people say choose a niche that you love and have a passion for and others say choose one where the money is, I say it takes a mixture of both. It's easy to get burnt out on a website when you're taking on a topic you don't enjoy. Step one in starting out is brainstorming niches that you really love. What makes you the most excited about? What could you write about all day long? Make your list of everything that makes you excited in this world, the more experience you have in it the better. Don't stop at just one or two. Try and come up with as many as you can think of. Your next step is to see where the money is. Sure, you might be the best under water juggler in the world, but you are going to have a tough time building a profitable affiliate site around that. Finding out if a niche is profitable or not can be tough for those new to building a site, but the key is to do as much research as possible. Visit the different affiliate networks out there and see what programs might fit your potential audience. Do some Google searches and see if anyone else is monetizing the niche. I'd be more afraid of a niche where there is no competition, than a niche that has medium to high competition. If other people are making money in the niche, then chances are you can too if you work harder than your competition. Logan Thompson is a full time affiliate marketer who blogs about building online businesses at LoganThompson.me. He's also an author, entrepreneur, and lover of all things marketing. Follow Logan on twitter @drumminlogan. When you're thinking of entering a new niche, ask yourself what unique value you will bring to the table. What reason will customers have to visit your site? What information or resource will you provide that they can't get anywhere else? Some of my most spectacular failures as an affiliate are directly related to not having a solid answer to that unique value proposition question. Put yourself in your prospective visitor’s shoes – what value will they get by interacting with your site? If it's just some half-baked blog post or made-up product review, that's probably not going to cut it. Instead it takes some real thought (and likely some real time and effort) to come up with an affiliate business model worth doing business with. There are some hugely successful affiliates out there dominating their niches because they went after them with a unique angle. Consider what TripAdvisor has done for travel reviews, or what RetailMeNot has done for online coupons. Both are basically affiliate businesses, but both deliver massive value for their users. Ask yourself if you can bring that same level of value to whatever niche you’re considering. Nick Loper is a veteran affiliate marketer, author, and a lifelong student in the game of business. His latest role is as Chief Side Hustler at SideHustleNation.com, a growing community of part-time business owners. Need a leg-up in getting your biz off the ground but short on time? Grab Nick’s free "Cliff’s Notes"-style guide to the world’s best business books here. Follow Nick on Twitter at @nloper. I found my first niche because I saw a need. No one was catering to GLBT people and weddings, so I launched a site with what I would want to see if I was going to get married. Not what others are writing because they think that is what this community or what "these people" want. After I went into clothing and fashion which was more competitive and then I found micro niches were the easiest to take over. Once you take them over you can drive traffic from those sites into more general ones and really start to grow. I recently entered into a very competitive entertainment niche because I found a large group of people with no resources for them. I now fulfill them and make money off of the website. The trick to finding a niche is not to find one and stick with it. If your site dies, falls or Google slaps it, you are done. Find multiple niches you are interested in, can write at least 50 solid and informative articles about and make sure there is a need for the type of resource you will provide. I recommend you have at least two or three so that if one fails, you can have the other to support you while you fix the one that took a hit. You also need to be careful of programs you choose to promote. Make sure they protect you and do not work with adware, trademark bidders and that no active affiliates show up for their url or trademark + coupons in Google. All of this can cause content, PPC and niche Affiliates to lose sales and have their cookies overwritten. Do remember that we are talking about an "affiliate niche" (a smaller part of a larger mainstream market). When finding your niche, go with what you are passionate about. There are most likely several affiliate products that you will be able to promote to support your passion. Choosing the right one can be overwhelming but if you are passionate about something and have the knowledge (some experience would be great), then it is easier to work on with the products surrounding your niche. If you don't have the knowledge, do find the time to learn more about the niche you choose. Potential customers today seek for information before making a purchase. If you can provide value, build credibility and help them solve their problems, I say you are on the right path. Don't give up on a topic just because you're not knowledgeable about it. You don’t need a PHD to create a website about most subjects. If you can find a niche where you are really passionate about, I am almost sure that you'll soon become a trusted expert. What magazines do you subscribe? What about your job? Present and past? As you can see, just by looking at your day to day activities, past experiences, etc., you can most likely identify a niche that you like and can work with. Good Luck and to your success! Francisco Perez (aka ditesco) is a Business and Inbound Marketing Consultant, and founder of iBlogzone.com. iBlogzone's main objective is to help startups and small business owners achieve success in their online ventures. Follow Francisco on Twitter at @ditesco. The biggest piece of advice I wish I had when starting out as an affiliate would be, to pay less attention to keyword search volumes and place more emphasis on the potential profitability of a niche. I made the mistake early on in my online career of trying to rank a website for the keyword "How To Make French Toast", which at the time received over 74k searches per month according to the Google Keyword Tool. Once I hit the top 3 I thought I had made it and the money would come rolling in. I quickly realised that there was literally no money to be made in this niche. No one wants to buy Google Ads for people making French Toast, something I would have found out much sooner if I had researched. Which brings me on to my next point. There is of course another element to consider when choosing an affiliate niche and that is existing competition. Forget all these fancy calculations, number of competing sites and so on, your REAL competition is the top 10 sites in Google, scratch that, it's the top 5 as we are ambitious right? If you look at the top 5 and think you can do better, then you are on to something. There are tools to help with this process and my tool of choice is Long Tail Pro, which provides both keyword search volumes, average keyword competitiveness and rank tracking all in one. My final piece of advice would be, before you dive in to a niche, think about how you will monetise once the site is complete. People often do this after the fact and realise they have wasted a lot of time and effort. Lewis Ogden is the author of Cloud Income, a blog focused on what's working now in the world on SEO and Internet marketing. With guides such as how to build a private blog network and building a niche site to $1,000/month. Follow Lewis on Twitter at @CloudIncomeUK. I'd first like to refer to Lewis's epic article on Matthew Woodward's blog. Finding niches using other people's data has always been a fantastic way to go about it, some call it cheating, I call it a quick win for finding success in an industry that is heavily researched. Personally, I find industries by talking to people, I ask them about their online habits, what they buy, what they do etc... Just average joes that are maybe friends or family that use the internet a lot. I've found about 30 golden niches doing this, niches that are mostly unused by other affiliates and some that aren't at all. When it comes to business, people seem to think they know everything about their industry, so? Do you know everything about everyone online habits and how to optimize it for your target niches habits? NOPE! So go talk to a few, you don't even have to pay for a focus group, just speak to friends/family in that target audience. Charles Floate, aka the God of SEO, is a fulltime blogger and own Godlike Marketing, a UK based SEO Services & Products Company. Charles has been in SEO for nearly 5 years (as of February, 2014 it will of been 5 years) and is currently doing work for over 35 international clients and businesses. Follow Charles on Twitter @Charles_SEO. Over the past 9 years I've tried A LOT of different niches with affiliate marketing, but I have had by far the most fun and most success promoting things I am interested in. You will have a much easier time creating content and connecting with your audience if you are working with a niche that you enjoy. No matter what the niche you will probably be excited to get working at first, but as time goes on you won't have that same excitement unless you are working within a niche you really like. My favorite niches (besides affiliate marketing) that I work in are for the TV shows I watch regularly. I have two of the largest communities for my two favorite TV shows that I have been watching for years. I work on it daily and it makes me happy! 11. Think if you can not sell to your visitors, but help them make an educated purchase of goods online. From a network perspective, we often find that new affiliates who start a blog only as a way to facilitate affiliate links aren't successful. On the other hand, new affiliates who have started a site with the focus on writing about their passions, say a blog about outdoor gear reviews or their world travels, and approach the affiliate part as a secondary purpose of their blog are often very successful. Your niche should be your passion for something you truly enjoy and the motivating factor for being online in the first place - not to "make a bunch of money online". Once you've found that niche, you have a much better platform to move forward with your affiliate marketing efforts. Once you do move forward, don't resort to simply throwing up a handful of banner ads and call it good. All successful content-driven affiliates will tell you that deep integration of your marketing into your content is the most successful strategy, most of which can be accomplished by looking for affiliate tools outside of the quintessential and tired banner ad. Look for opportunities to deep link to products or brands you mention in your content with custom affiliate link builders or create gift guides for your readers and visually represent the products in the guide with a highly interactive product widget. Try not to sell your visitors, but to help them make an educated purchase of goods online. Your niche shouldn't just be what you represent on your site but also how you plan to weave in your affiliate efforts in the most helpful way possible to your readers. Chad Waite is the marketing manager for the AvantLink affiliate network, providing affiliates with industry-leading affiliate marketing tools and programs. Follow Chad on Twitter at @ChadW8. 12. Be different. Know your "Why". Set goals. - Is there anything in particular I know a lot about (and am interested in) that I can share with others in a new, valuable way? - Is there a niche I can focus on that others haven't really done yet? - Whether my topic has been done before, can I do it better than everyone else? - How am I going to market the products and services I’d like to offer? Will I write personal opinions on a blog, do product reviews, create shopping comparison opportunities, etc? - What time/resources am I going to need to make this project successful? - What goals do I have? Is it to quit my full time job? Is it to have some extra spending money each month? Is it to have a creative outlet as a hobby that I can monetize? It's essential you understand the PURPOSE of why you're getting into affiliate marketing and what GOALS you want to accomplish before you get started. Once you understand your "why" and your goals, make a short list of things you like that are specific enough that you can become the go-to expert on that topic, such as a particular type of camera lens, how to bake gluten free, or where to buy the best hand-made creative toys for toddlers. Be specific. Love your topic. Be different. Know your "Why". Set goals. And keep at it! This is a long-term commitment, so be sure you're consistent and ready to put in the effort! With these steps in mind and with proper, consistent execution, I’m sure you'll reach your targets in no–time!" Sarah Bundy is the award winning founder and CEO of All Inclusive Marketing, a world-renowned digital marketing agency delivering strategic, performance driven results both a-la-carte and through expert "all inclusive" packages. Follow Sarah on her blog or on twitter @svbundy. In order to create a great site, you need great content, and engaged followers. To be able to sustain this level of engagement, you need to post regularly and remain enthusiastic and passionate about your subject so I truly believe the greatest success will come about through blogging about what you genuinely love. My own site at So Sew Easy started out this way just 12 months ago. I had no idea about blogging for money and just started writing about a subject I was interested in. I never even imagined people would find my site in the vastness of the internet and want to follow along. It became successful quite by accident and once I became aware of the possibilities and learned just a little about niche blogging, I concentrated my efforts into a particular area and it paid off. Whatever your subject, however crazy you are about something obscure, you can be sure there are people out there just as crazy about it as you are. If you find a small group of people with whom you connect through this shared interest, nurture them, give them everything you can, be the person they want to follow, be genuine and once you’ve found your natural niche your affiliate marketing success will follow. Deby Coles writes passionately in her sewing niche at So Sew Easy and also offers advice to small and new bloggers on how to earn money from blogging at Moms Make Money. She created two top 100 sites in her first year. Her monthly income reports make interesting reading and motivate those starting out to follow her suggestions for their own affiliate marketing success. Follow Deby on Twitter at @DebyAtSoSewEasy and Google+. In affiliate marketing, information is king. Do your research and understand the general landscape before you make a decision on what to pursue. In my view, the affiliate space is split into 2 major categories: organic and paid. Organic refers to building up a web property (including email lists) that adds some incremental value, whether that's great original content (think mom blogs), a deal site (think comparison sites or Groupon), or a unique technology-based proposition (think free mobile or Facebook games). The concept is that you're going to provide something of value to your users, and in turn, you promote affiliate offers to them. The key here is a viable business concept that actually garners an audience. You'll need to rely much on search engine rankings, and your awesome content should help with that. Paid traffic refers to media buyers who purchase traffic from an existing site or ad network and attempts more or less an arbitrage play. The value add for the media buyers in this equation is the initial creative and also any additional pre-sell landing pages that will increase the conversion rate. If the revenue generated is greater than what you paid in traffic costs, then you're ROI positive. Contrary to the organic path, the key to media buying has a lot to do with data and statistics. It is termed as "performance marketing". Your goal is to be able to analyze and crunch large data sets in order to optimize your campaigns. Do your research and pick a path that's most akin to your skills and goals. Understand the players in the space from traffic sources to affiliate networks, and once you find what you want to go after, take action and attack it ruthlessly! Tom Fang is the founder of iPyxel Creations, providing optimization and automation software for direct response performance marketers. Their blog focuses on specific actionable tips and tutorials. When looking for a niche, my biggest concern is to make sure it's not something which I personally find boring. I always select niches I personally know about. Even if I don't know much, some experience helps me understand the ins and outs of a niche and create helpful content. No matter if I'm using paid advertisements or organic traffic, the main thing in my opinion is to know the needs of your prospects and feed them with what they want. I will give an example of Forex niche. When I started seeing success in my internet marketing career, I decided to learn something new and started investing in Forex trading. I ended up creating a very successful Forex niche website where I educate new people about making money on Forex. Whenever anyone asks me about selecting an affiliate niche, my answer is always same: select a niche you know and you are interested in. Our purpose is not just to monetize our websites but to provide valuable information to our website visitors. KJ Rocker is an online marketer with 4 years of experience and Founder of KJ Rocker F.Z.E, a Dubai Based Company. He also writes for his Affiliate Marketing blog kjrocker.com. Connect with KJ on Twitter @kjrocker and Facebook. As you can see, many of our experts are talking about the importance of following one's passions when choosing an affiliate niche. Beyond that, they show how exactly you can see if the niche you have in mind is potentially profitable. Do you agree with the methods suggested? What do you think is most crucial in finding an affiliate niche that'll bring you consistent income? Share your ideas in the comments below!